Join us in Toronto on September 8-9-10, 2017 to find out how co-operative business models can be used to build a better digital economy. What can digital entrepreneurs, freelancers, students, policy-makers, community leaders and activists expect at Disrupting the Disrupters? Inspiration! Learning! Collaboration! Quite simply, we need better, more sustainable business models. The promise of the sharing economy, powered by peer-to-peer connections on digital platforms, has not delivered. The results of economic disruption by a few monopolies are now clear: platform-driven precarious employment, accelerating disparities, dissolution of labour standards, undermining of regulatory safeguards, and the monetization of private data. The co-operative enterprise model – joint ownership by stakeholders (employees, and/or customers, and/or communities) – can address two fundamental problems. Co-op enterprises can disrupt and eventually stop the uberisation of work and living standards in the gig economy. Co-ops can crack the start-up monoculture – one that forces founders to “pivot” good ideas and great on-line communities into enterprises that monetize user data for the benefit of outside investors. The co-op ‘hack-and-own’ platform revolution is already emerging. These types of co-op start-ups now exist in many countries around the world, including Canada. The potential is there…if we act quickly to reinforce and harness these ideas and promote co-operative values and principles, we can enjoy more equitable, social, and sustainable platform communities and business. In addition to inspiration, Disrupting the Disrupters will be a learning experience. Entrepreneurs working on digital platform projects have more choices on how to structure their businesses than are typically discussed with investors, advisors and business incubators. Various combinations of stakeholders – employees, customers, and communities – can form powerful, mutually supportive co‑operative partnerships that can be sustainable and reward founders. As journalist and platform co-op advocate Nathan Schneider argues, "There’s a whole set of companies that inhabit the territory between boom and bust—companies that have good cash flow and a devoted user base, but that aren’t satisfying the cravings of Wall Street. These are the kinds of companies that might lead the way for a different kind of Internet; one that aligns ownership with the interests of its customers, and puts the ownership of companies in the hands of the workers and users who depend on them." Even though cooperative ownership structures often provide a better and more sustainable approach for online enterprises, these alternatives are still not well known. 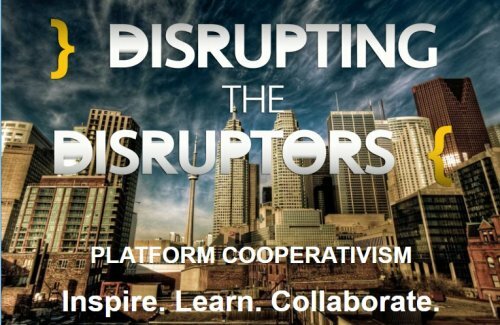 Disrupting the Disrupters is an opportunity to learn about how platform co-operatives that have already emerged compete with shareholder-owned digital businesses everywhere. Let’s learn from their leadership! So, let’s build the new co-op platform ecosystem together! As platform monopolies such as Uber and Airbnb run into regulatory, labour, and public relations opposition, the opportunity exists for member and stakeholder owned platforms to offer an alternative. How can the principles of economic democracy – which drove the 20th-century co-operative movement – be brought into and accelerated in today’s emerging digital economy? How can investors in the digital co-op economy make a fair return while these types of platforms achieve sustainability? There’s no limit to the transformative power of co-operative platform ideas, whether at a local or a global “network effect” scale. If we collaborate, locally, nationally, and internationally, we can build a sustainable digital economy with open source values and economic democracy. Join us September 9-10, 2017 in Toronto, as we bring together leading voices – and people like you – to explore these questions and investigate new opportunities and visions for Canadian tech startups. Let’s harness the power of Inspiration, Leaning and Collaboration to create a more people-centred digital economy!